Thanks for visiting my blog :) I am now following back! Ha ha... Acceptance! I like that! haha i actually had that quote on my post before last! Shoes & bags make me happy!!! Shoes make me so happy. I totally agree! shoes make me happy!!!! AWESOME :P it makes me laugh! Oh my gosh - I seriously just sent this to so many of my girlfriends! Hilarious! New to your blog - love your perspective and images! I follow you back darling! gracias por comentar en mi blog!una frase muy certera! Love this! I am now following you! haha... that's a great quote! I am following you too! That quote it's so me! I love it! Lovely post and great blog! I like it! Love shoes and love this quote! 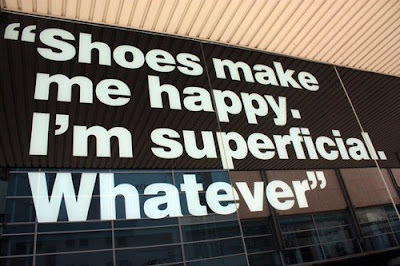 :) lol, ... "whatever"
does a concern with the veneer and with the external need always be equated with superficiality?